Swan Emerson is a full service equipment builder with an emphisis on providing customer specific solutions. If you have a process you need to automate, we can build equipment as part of the solution. All our equipment is Made in the USA for the highest quality. Pro Wrap 48 is a linear stretch wrap machine designed for the wrapping of pre-painted interior doors. The protection of the finish is critical to maintain a quality product. This machine drastically reduced the amount of labor required to manually wrap doors. 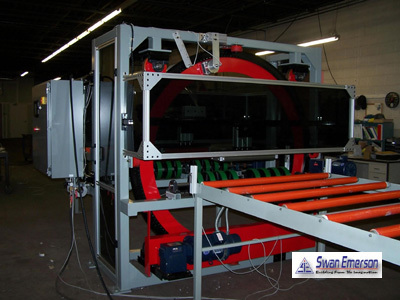 The machine design was based on the client's needs and from those needs Swan Emerson developed the machine specifications. The creation required a "from scratch" approach using off the shelf, custom fabricated, and machined components. Pro Wrap 48 uses a PLC to control all aspects of operation. Operator interface is achieved via touch screen.